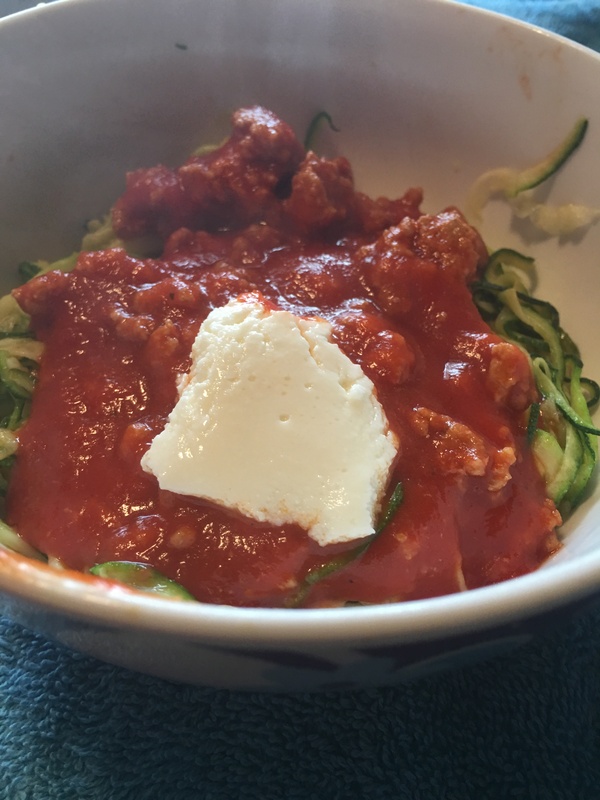 As I look for different ways to eat healthier without changing everything in my diet, I came across ZOODLES. Well, I was given a Spirializer for Christmas so that may have helped. I had no idea how this would taste or come out. I just figured that it was a gimmick but I would keep an open mind no matter what. The Spirializer from Pampered Chef could not be easier to use. It is completely dishwasher safe and durable. So for this dish, I made my usual Sunday Sauce with ground turkey instead of ground beef. I have been making it this way for a few years now and I prefer the turkey, unless I have ground venison, that tastes so much better but I digress. The only thing different here is that I put zucchini noodles in the sauce instead of pasta. After I made the spirals, I put them in a hot frying pan with some olive oil. I kept tossing them until the oil was dried up. Put some in a bowl, topped with sauce and some ricotta. I was amazed. I love it! Honestly, I can see me doing this more often.